Please register or log in to continue. Bitsy Baby is dressed up and ready to go trick or treating! She loves her big witches hat and her stripy red and white tights. She’s holding on tightly to her toy broomstick, and the orange pumpkin by her feet finishes off this sweet little Halloween scene. 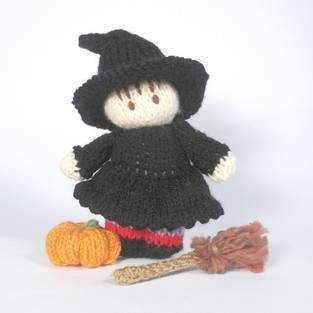 Bitsy Witch is quick and easy to make. She’s an ideal last-minute Halloween decoration or gift. The body and head are knitted in one piece and after seaming and stuffing the legs are created by sewing a seam through from front to back to divide the legs. The arms are knitted separately and are sewn on when making up this cute little character. All the doll and accessory pieces are knitted flat and use basic shaping. This pattern is suitable for confident beginners- yarn overs are used in the skirt section, and yarn is carried up the side of the work for the leg stripes. A cotton bud (Q tip) is used to make the broom handle, if you are giving this doll to a child you should omit the cotton bud from the broom handle. Size-14cm /5.5”- Just the right size to fit in a pocket!